When you’re a mom it’s hard to find time to actually sit down and eat a meal… on top of that, a healthy meal? You usually find yourself snacking more than anything. That’s why I’ve been looking up easy, healthy snacks! 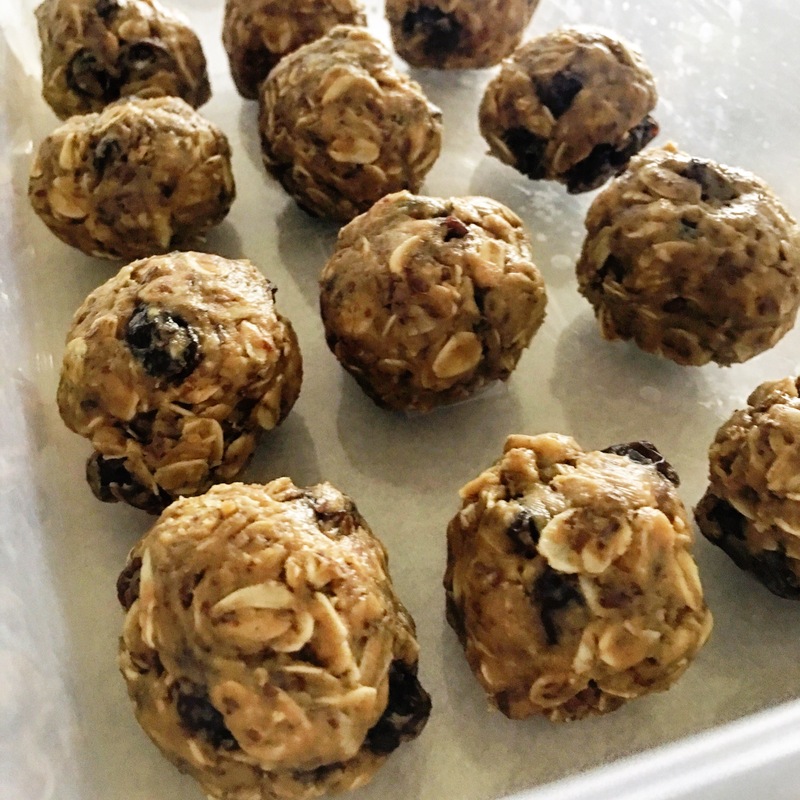 Plus, these oatmeal bites aren’t time consuming to prep, require no baking, and all the ingredients are bulk items where you’ll easily be able to make another batch without having to go to the grocery store! Can you tell where we shop? 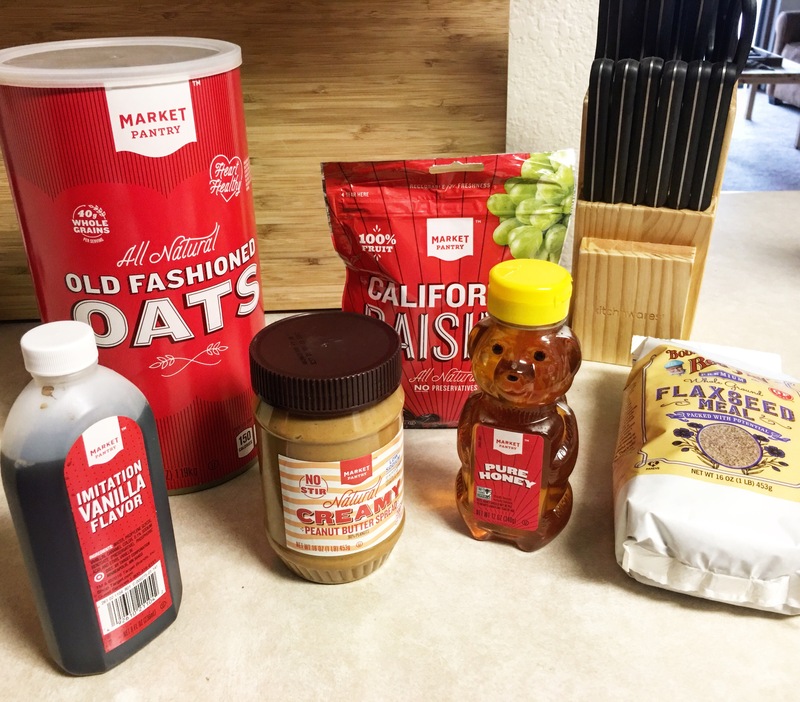 #ILoveTarget Defintely buy Market Pantry ingredients versus name-brand. They’re cheaper and they taste the exact same. Plus, last night when I went, I used cart-wheel (Target’s coupon app) and got some of these ingredients for even cheaper! First off, in a large mixing bowl you’ll combine and mix the oats, ground flax seed, and pinch of sea salt. Then in a separate bowl, measure out your peanut butter and put it in the microwave for 30-40 seconds (caution: bowl will be very hot when you take it out, take my word for it). Add honey and vanilla to your melted peanut butter, mix well. Add mixture to the bowl of oats, flaxseed and sea salt. Add raisins and mix well. You’ll then roll the dough into spoon size balls and put into a container. You’re more than welcome to eat them right away! But I personally think they taste better refrigerated. I leave them in the fridge for at least 30 minutes. Here’s a picture of these yummy, yummy snacks! Enjoy and let me know what you think if you make the recipe!